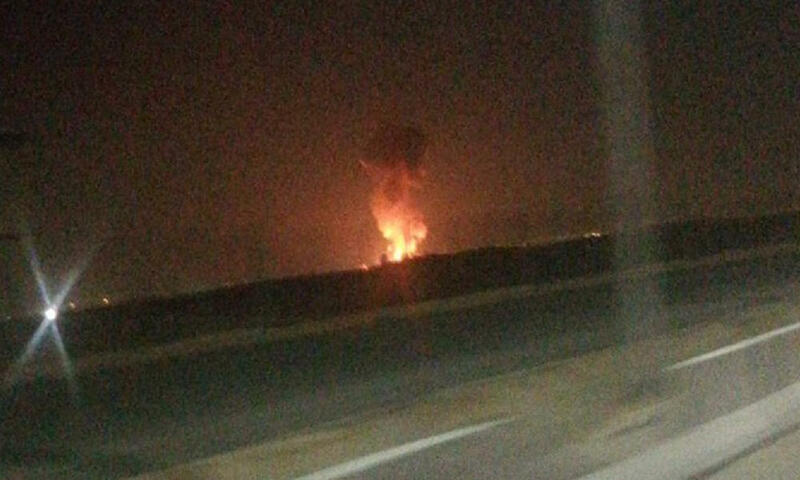 A large explosion has rocked a petrochemical plant near Cairo International Airport, injuring at least 12 people, officials and witnesses say. The blast was heard and felt across a large area. The incident happened at about 10:30 p.m. local time on Thursday when an explosion was heard across the eastern part of the capital. Photos taken from a distance showed a fireball and a thick plume of smoke billowing from the scene. Officials said the explosion involved 2 fuel tanks at a petrochemical company near the airport, but the airport itself was not affected. At least 12 people were injured, according to local media. Flights were briefly suspended while officials investigated the nature of the explosion, the Reuters news agency reported. Flight operations resumed a short time later. There was no indication of a link to terrorism, according to local authorities. An army spokesman said the blast is believed to have been caused by high temperatures. Woman arrested, charged with acting as a Russian agent in the U.S.